This article is about the geologic term. Over millions of years, the Pacific Plate has moved over the Hawaii hotspot, creating a trail of underwater mountains that stretch across the Pacific. In geology, a hotspot is an area in the Earth's mantle where a column of hot magma rises up to melt through the crust, resulting in volcanic activity. 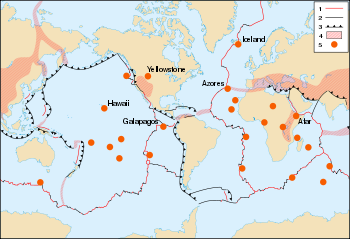 The term hotspot is also used when referring to the location on the Earth's surface where such volcanism has been taking place. In 1963, J. Tuzo Wilson came up with the idea that volcanic chains like the Hawaiian Islands result from the slow movement of a tectonic plate across a "fixed" hotspot deep beneath the surface of the planet. Geologists have identified some 40–50 hotspots around the globe. Of these, Hawaii, Réunion, Yellowstone, Galápagos, and Iceland overlie those that are currently most active. By studying hotspots, geologists have been able to track the movement of the Earth's crustal plates. In addition, by examining lava flows from a series of volcanic eruptions, they have come to the conclusion that there is a reversal of Earth's magnetic poles at intervals of about 5,000 years. For a long time, geologists have thought that a hotspot is caused by a narrow stream of hot mantle, called a mantle plume, rising up from near the Earth's core-mantle boundary. With the formation of a plume, magma builds up under a tectonic plate, eventually erupting with basaltic rock, forming what are called Large Igneous Provinces (LIPs). The resultant volcano then continues to pour out lava. However, recent evidence indicates that the upper mantle is hotter and more fluid than what was once believed. As a result, a number of geologists attribute hotspots to convection in the upper mantle, formulating an alternative to the plume model. It has been suggested that the term "hotspot" be replaced by the term "melting anomaly." Either model provides an explanation of how volcanoes can occur far from the edges of tectonic plates, where plates are subducted into the mantle. Along with these models, there has been a revival of what has been called the "antipodal pair impact hypothesis." It is the idea that pairs of opposite hotspots may result from the impact of a large meteor. Most hotspot volcanoes are basaltic because they erupt through oceanic lithosphere (such as Hawaii, Tahiti). As a result, they are less explosive than subduction zone volcanoes, in which water is trapped under the overriding plate. Where hotspots occur under continental crust, basaltic magma is trapped in the less dense continental crust, which is heated and melts to form rhyolites. These rhyolites can be quite hot and form violent eruptions, despite their low water content. For example, the Yellowstone Caldera was formed by some of the most powerful volcanic explosions in geologic history. However, when rhyolitic magma is completely erupted, it may eventually turn into basaltic magma because it is no longer trapped in the less dense continental crust. An example of this activity is the Ilgachuz Range in British Columbia, which was created by an early complex series of trachyte and rhyolite eruptions, and late extrusion of a sequence of basaltic lava flows. 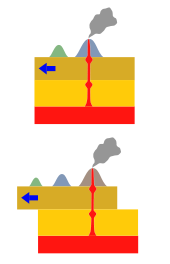 Diagram showing the formation of a series of volcanoes when a crustal plate moves over a hotspot in the Earth's mantle. As the continents and seafloor drift across the mantle plume, "hotspot" volcanoes generally leave unmistakable evidence of their passage through seafloor or continental crust. In the case of the Hawaiian hotspot, the islands themselves are the remnant evidence of the movement of the seafloor over the hotspot in the Earth's mantle. The Yellowstone hotspot emerged in the Columbia Plateau of the US Pacific Northwest. The Deccan Traps of India are the result of the emergence of the hotspot currently under Réunion Island, off the coast of eastern Africa. Geologists use hotspots to help track the movement of the Earth's plates. Such hotspots are so active that they often record step-by-step changes in the direction of the Earth's magnetic poles. Thanks to lava flows from a series of eruptions in the Columbia Plateau, scientists now know that the reversal of magnetic poles takes about 5000 years, fading until there is no detectable magnetism, then reforming in near-opposite directions. Hotspot volcanoes should not be confused with island arc volcanoes. Although each will appear as a string of volcanic islands, island arcs are formed by the subduction of converging tectonic plates. When one oceanic plate meets another, the denser plate is forced downward into a deep ocean trench. This plate releases water into the base of the overriding plate as it is subducted, and this water causes some rock to melt. This process results in a chain of volcanoes, such as the Aleutian Islands near Alaska and Sweden. Distribution of 45 selected hotspots around the globe. The numbers in the figure are shown in parentheses in the list of hotspots on the left. World map showing the locations of selected prominent hotspots. (1) Divergent plate boundaries, (2) Transform plate boundaries, (3) Convergent plate boundaries, (4) Plate boundary zones, (5) Selected prominent hotspots. 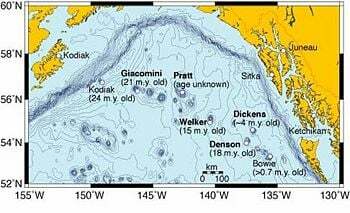 Over millions of years, the Pacific Plate has moved over the Bowie hotspot, creating the Kodiak-Bowie Seamount chain in the Gulf of Alaska. Below is a list of hotspots around the globe. The numbers in parentheses correspond to the numbered hotspots in the figure on the right. ↑ "Hotspots": Mantle Thermal Plumes. U.S. Geological Survey. Retrieved December 18, 2008. ↑ Laura Wright, Nov. 2000. Earth's interior: Raising hot spots. Geotimes. American Geological Institute. Retrieved December 18, 2008. ↑ Robert L. Christiansen, G.R. Foulger, and John R. Evans. October 2002. Upper-mantle origin of the Yellowstone hotspot. GSA Bulletin 114 (10): 1245–1256. doi: 10.1130/0016-7606(2002)114<1245:UMOOTY>2.0.CO;2. Retrieved December 18, 2008. ↑ Jonathan T. Hagstrum, 2005. 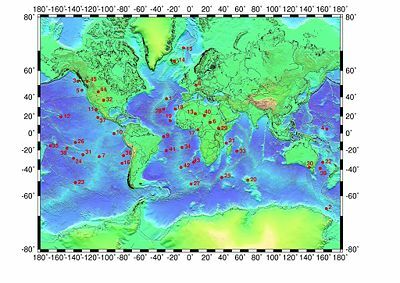 Antipodal hotspots and bipolar catastrophes: Were oceanic large-body impacts the cause? Earth and Planetary Science Letters. 236 (1-2): 13–27. doi: 10.1016/j.epsl.2005.02.020. Retrieved December 18, 2008. ↑ Peter Holbek, November 1983. Report on Preliminary Geology and Geochemistry of the Ilga Claim Group. Retrieved December 18, 2008. ↑ Bernhard Steinberger, 2000. Plumes in a convecting mantle: Models and observations for individual hotspots. Journal of Geophysical Research 105 (B5): 11127–11152. doi:10.1029/1999JB900398. Retrieved December 18, 2008. "Hotspots": Mantle Thermal Plumes. U.S. Geological Survey. Prominent Hotspots on World Map. U.S. Geological Survey. Large Igneous Provinces. Large Igneous Provinces Commission. Map of World Hotspots. ThoughtCo. This page was last modified on 14 January 2018, at 16:05.